I just discovered an amazing seasonal beer called Pipeline Porter. It's brewed by Kona Brewing Company in Hawaii but distributed to only a handful of markets including San Diego. 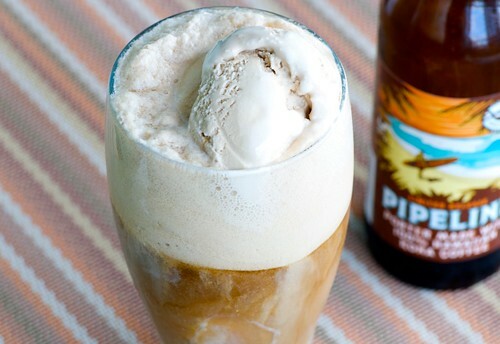 It may just be the perfect beer for a Beer Ice Cream Float. Made with rich, freshly roasted 100% Hawaiin Kona coffee, Pipeline Porter is a smooth, dark, complex beer with a distinctive espresso flavor. It's delicious on its own, but it's downright decadent when paired with premium coffee ice cream for an authentic Beer Ice Cream Float. If you can't get Pipeline Porter, then substitute another porter or stout with chocolate or espresso notes. Then celebrate St. Patrick's Day, with or without the leprechauns. 1. Fill a tall chilled glass with ice cream, and slowly pour beer over it. Enjoy! You're insane. And, I love it. As crazy as a beer float seems. I think I would like this. Rootbeer floats have always been too sweet for me so this version might be the ticket. Now there's a new way to enjoy Chocolate Beer that I love. Your favored brew is unavailable to us here in South Mississippi, but we DO have something that fits perfectly into your recipe: Lazy Magnolia Brewery's Southern Pecan brown ale. Makes a fantastic float, not unlike your fave, I'll wager. That is a great idea! My husband is obsessed with root beer floats. I bet this would be right up his ally, too. This is SO simple but such an awesome idea! I've heard of Kona Brewing Company, but haven't tried the Pipeline Porter yet. Sounds fantastic with the coffee ice cream! That's only a short step away from beer milkshakes. Is that really a path we want to go down? I'm so excited for St. Patrick's Day and a beer ice cream float sounds like the perfect way to celebrate! kathleen-These beer floats are seriously good. I swear. jean-Oh, I had a pecan ale when I was in RI and absolutely loved it. Sounds perfect for a float! unplannedcooking-Then he'll really love these! sari-You may be surprised at how much you like it! przepisy-Coke floats are good too! lisaiscooking-If you even find it, I highly recommend trying it. patty-It makes you feel festive. That's for sure! ramblingtart-I hope you find it! tamilyn-It shouldn't be too hard to find a guinea pig! My husband and I made a drink like this from a recipe found in the seat back magazine on Southwest Airline. It made a milk shake with guiness and vanilla ice cream. It tasted great. The beer taste cut the sweetness of the ice cream. Beer Ice Cream Float-oh my, haven't heard of the like. I am going to try it. Love love love, Brooklyn brewing black chocolate stout over vanilla ice cream! A few weeks ago, we’d picked up a bottle of Black Boss Porter, which had since been languishing in my fridge. A big, dark, roasty beer that coats the tongue with a wash of coffee, caramel, malt, molasses, and maple syrup, it’s delicious—but not exactly a prime dinner companion. So it waited, and I wondered. And then I got thirsty, as I’ve been known to do—for dessert. Running with a vague recollection of something strange I’d once read in a restaurant review, I took down a drinking glass and my trusty spring-loaded ice cream scoop. I stacked three golf-ball-size scoops of vanilla bean ice cream in the glass, popped open the porter, and poured.